BLUES follow-up meeting has taken place at the University of Ljubljana to define the project’s methodology tool to be created based on successful entrepreneurship education criteria. 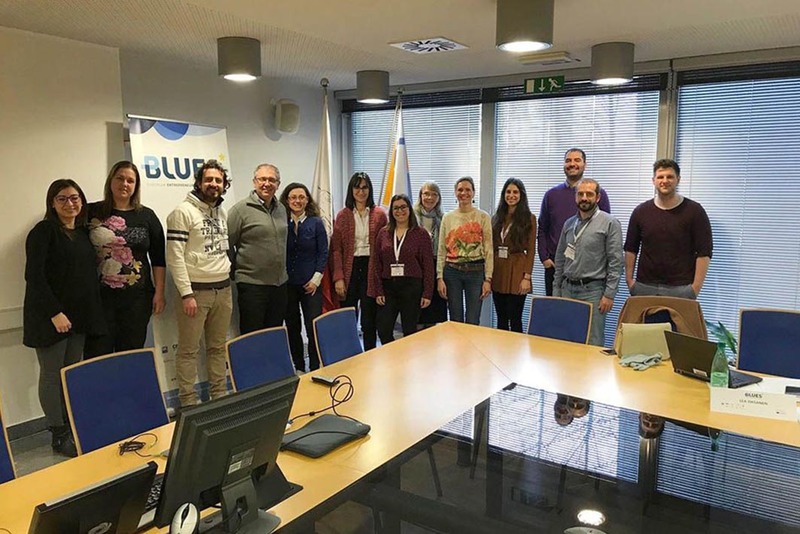 As part of the Erasmus+ framework, BLUES will create and implement a blended learning methodology and training resources to develop European students’ entrepreneurship skills to improve their employability. Ljubljana, April 11 2018 – The partners of BLUES, co-funded by the European Union, met in Slovenia last week: This second transnational project meeting took place at the premises of the Faculty of Social Sciences, University of Ljubljana, from April 5 to 6, with representation of all partner organisations, who discussed the status of the project’s work packages and established next actions for the development of a successful methodology that strategically combines both digital and face-to-face training modules to develop entrepreneurial skills in students. There is an urgent need to promote students’ entrepreneurial mindset and competences so they can properly adapt to current times and either add value to companies or create their own business ventures, especially in labour markets characterised by limited job opportunities such as Spain, Italy and Slovenia. During the meeting, the project partners discussed the findings of the actions carried out so far, especially literature review to define the criteria for what is considered successful entrepreneurship education and the analysis of this kind of education, for which they have interviewed entrepreneurship experts and researched case studies in the partners’ countries. Based on the identified needs and success criteria, the project team members are designing the BLUES methodology as a blended-learning course open to undergraduate students from any discipline to promote the soft skills involved in the entrepreneurial mindset, focusing on the identification of market needs and converting them into business opportunities. The BLUES methodology intends to conduct the digital part of the training as a MOOC (Massive Open Online Course), so that a wider audience can benefit from the programme. Students who successfully complete the MOOC will be able to apply for participation in intensive face-to-face courses to be held in Italy, Portugal, Slovenia and Spain in 2019, which will apply multi-disciplinary group work, roleplay, flipped classroom and other innovative methodologies to help students identify market needs to set up companies, and which will actively involve local entrepreneurs and business owners. The quality of the project outputs will be assured by Lappeenranta University of Technology (Finland) –a reference model for entrepreneurship education-, and a multidisciplinary team of external European experts that will be set up within the coming weeks. The project members scheduled preliminary dates for the next project meeting that will take place in autumn in Italy, and the multi-stakeholder training activity that will take place at the premises of Nova University of Lisbon at the end of this year. The BLUES (Blended-Learning International Entrepreneurship Skills) programme started last October 2017. The project was born within the Erasmus+ European programme framework and is being carried out with the collaboration of partners from five countries: Spain, Italy, Portugal, Slovenia, and Finland. This ambitious initiative has been financed by the European Commission with a budget of over €270,000 and will also involve local business representatives. The project relies on the coordinated efforts from the University of Cantabria, Santander International Entrepreneurship Centre (CISE) and the business association CEOE-CEPYME Cantabria in Spain; Nova University of Lisbon and Madan Technological Park in Portugal; the University of Ljubljana and the Chamber of Commerce and Industry of Slovenia; the University of Perugia and Terni Chamber of Commerce in Italy, and Lappeenranta University of Technology (Finland).